The Institute for Entrepreneurship and Economic Development – (IPER) in cooperation with Association of Old Crafts and Skills – NIT, starting with realization of the project „Preservation and development of traditional Montenegrin crafts – goldsmiths“, which is supported under the Regional Local Democracy Program (ReLOaD), funded by the European Union, and implemented by the United Nations Development Program (UNDP). In Montenegro, the ReLOaD program is implemented in partnership with the Podgorica Capital City and the municipalities of Tivat, Kotor, Niksic and Pljevlja. which will take place on Tuesday, April 9th, from 13:00 to 14:00, in Podgorica, in IPER premises, ul. Kralja Nikole 27a / 4, business center “Čelebić”, across the road to the Clock tower. The project aims to promote and preserve the Montenegrin goldsmith as a unique craft of this kind, and its popularization, adding the epithet of the recognizable Montenegrin brand. The Montenegrin goldsmith dates back to the 17th century and represents one of the five most important worlds of crossed embroidery techniques. During the Info Day all participants will have the opportunity to get more information about the project itself and what it wants to achieve. 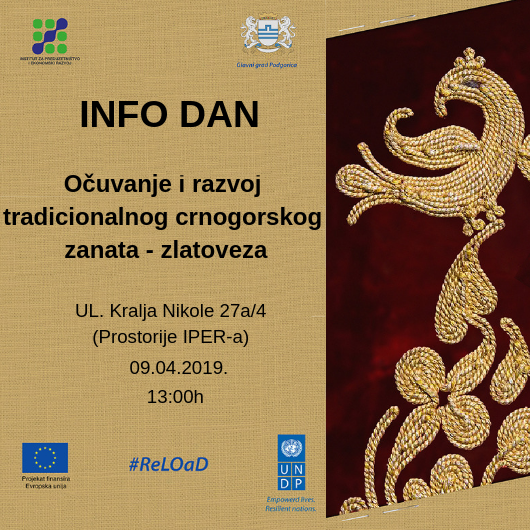 On the Info Day, an invitation will be open for all interested women to apply for the training “Embroidery skills of Montenegrin goldsmith”. Please confirm your presence no later than Tuesday April 9th until 10:00 am, by e-mail iper@t-com.me or by calling the phone number +382 20 622 931. The Regional Local Democracy Program in the Western Balkans (ReLOaD) is funded by the European Union (EU) and implemented by the United Nations Development Program (UNDP). Institute for entrepreneurship and economic development (IEED) is an economic think tank established with the aim to provide support in development of entrepreneurship and private sector in Montenegro.